Photograph on postcard of a young African American woman named Annie Holland, standing in front of the Seventeenth Street Mission in Richmond, VA. Se wears a long dress with a jacket. Her hands are clasped behind her back. "17th St. Mission Richmond, Va.
Annie Holland Age - 17. Has recited twice, perfectly, wk. apart. 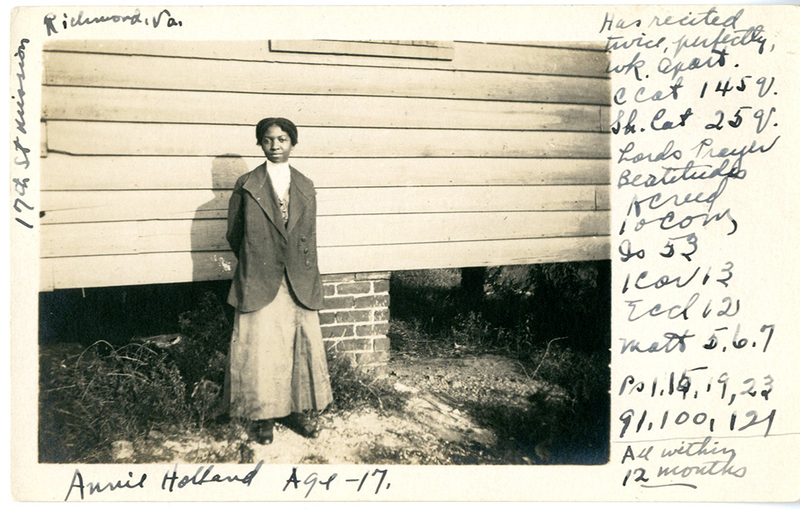 unknown, “Annie Holland, Age 17, Seventeenth Street Mission, Richmond, VA,” Social Welfare History Image Portal, accessed April 24, 2019, https://images.socialwelfare.library.vcu.edu/items/show/218.